low-lying Chol Kiri District in Cambodia suffers flooding for six months of the year which then contaminates safe water sources? in Tum Teav, a classic 19th century Cambodian tragedy, a novice monk named Tum sleeps with a adolescent girl named Teav and then is killed after kissing her at her wedding? most of the land area of Tuek Phos District, Cambodia, is currently listed for lease on the internet as a potential bio-diesel plantation? part of a 700 kilometre long minefield is found in Svay Chek District, Cambodia? students hoping to increase their brainpower before exams made offerings of incense to the body of a two-headed calf in Koh Sotin District, Cambodia? in Cambodia a person can catch the norry, an improvised bamboo train? in 1973, U.S. District Judge Orrin G. Judd issued an injunction prohibiting the United States' continued bombing of Cambodia, but a higher court stayed the ruling before it could take effect? catastrophic flooding in 2000 destroyed 95% of the annual rice crop in Srey Santhor District, Cambodia? directing the film Holy Lola made Bertrand Tavernier fall in love with Cambodia? during 2008 U.S. servicemen offered humanitarian assistance in Cambodia's Kampong Chhnang District as part of Operation Pacific Angel? in 1971, Cambodian army officer Um Savuth offered Richard Nixon his pet elephant as a gift? the 12th-century temple of Banteay Chhmar in Thma Puok District, Cambodia, covers more than half-a-million square feet? the 2005 docudrama The Burnt Theatre is set in Cambodia's Suramet National Theatre, which was destroyed by a fire in 1994? the first ever mission of the U.S. Peace Corps to Cambodia began in the Kampong Siem District? the female devata reliefs of the temple of Thommanon in Cambodia grip flowers very distinctively, using their ring and middle fingers whilst extending their index and small fingers? the planned International Finance Complex in Phnom Penh, Cambodia, will be the tallest man-made structure in the country? travellers in southern Cambodia must stop to pay their respects to the spirit of Yeay Mao? young escapees from a military police boot camp in Serei Saophoan District, Cambodia, are beaten by other residents when they are recaptured? the current governor of Malai District, Cambodia, is a former Khmer Rouge diplomat and aide to Pol Pot? the United Issarak Front leader Son Ngoc Minh declared Cambodian independence on June 19, 1950? the Buddhist temple of Ta Som (pictured) near Angkor, Cambodia, was built in the 12th century by the Jayavarman VII to honour his father Dharanindravarman II? the decking for the pier at the Sihanoukville Autonomous Port in Cambodia was so heavy that a railway had to be constructed to move it? the Boeng Tonle Chhmar wildlife sanctuary in Cambodia is home to many rare, vulnerable and endangered species including the Brahminy Kite (pictured)? the Phnom Penh Commercial Bank was Cambodia's 23rd bank and the first Japanese-financed bank in the country? at different times Phnom Voar (Vine Mountain) in southern Cambodia was a B-52 target, a rebel base, a killing field, a kidnapping site, and finally a peaceful mountain? although the longfin trevally is a prized table fish in Thailand and Cambodia, it is overall too rare to sustain commercial fisheries? blackfin scad (pictured) is a popular food fish in Cambodia and Thailand, where it is served fried, steamed or baked? Bateay District in Kampong Cham Province, Cambodia, was the site of an outbreak of the deadly H5N1 virus in 2006? 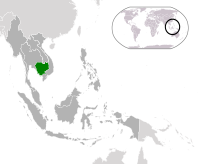 Chamkar Leu District in eastern Cambodia is home to a 6,000-hectare (15,000-acre) rubber plantation? fried spiders are a popular food in the Cambodian village of Skuon? Kampong Tralach District was home to Cambodia’s ancient capital of Lovek? Skuon town in Cambodia's Cheung Prey District is famous for fried spiders (pictured) seasoned with garlic and salt? Robert L. Howard received his Congressional Medal of Honor while part of a Hatchet Force operating near the Laos–Cambodia border during the Vietnam War in 1968? Cambodia's Mongkol Borei District was part of Thailand until the French demanded it back in 1907? Cambodia's "Romeo and Juliet" story, Tum Teav, is set in Tbong Khmom District? Cambodia's Prime Minister Hun Sen was born in a small village on the banks of the Mekong in Stueng Trang District? Cambodia’s current First Lady, Bun Rany, was once in charge of a Khmer Rouge hospital in Krouch Chhmar District? Memot District in eastern Cambodia is home to several huge prehistoric villages that date to the first millennium BCE? Ngo Dinh Nhu (pictured right), a Hitler admirer, younger brother and chief adviser to President Diem of South Vietnam, tried to assassinate Sihanouk of Cambodia and publicly vowed to kill his father-in-law? a 2.5 million dollar climate change project in Basedth District, Cambodia, aims to improve water supply and increase rice production? a 1.5 million dollar land concession project in Sameakki Mean Chey District, Cambodia, will provide land to 732 of the poorest farming families? a diarrhea epidemic in 2008 sickened 113 people in Kampong Leaeng District in central Cambodia? a huge Khmer Rouge airfield (pictured) still lies in Rolea B'ier District, Cambodia? a new government was not formed in Cambodia for almost a year after the 2003 Cambodian parliamentary election? Haung Falls in the Cambodian district of Dambae have carved out a 1,425 square metre stone crater under the cascade? Prey Chhor District, Cambodia, is home to an ancient temple built more than a thousand years ago? 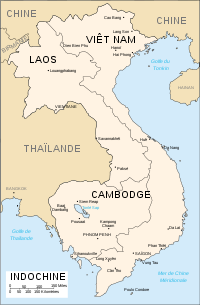 Ou Reang Ov District, Cambodia, was one of the 2008 sites for Operation Pacific Angel, a humanitarian mission of the U.S. Navy, Air Force, and Marines? Phnom Srok District of Cambodia is home to the rare Eastern Sarus Crane? Ponhea Kraek District was the home of Sek Yi, who died aged 120 years, claiming the title of Cambodia’s oldest man? Preah Netr Preah District in Cambodia is home to the “Dam of Widows”? 467 mass graves containing 32,690 victims were found in the grounds of a pagoda in Kang Meas District in Cambodia? History of location is unknown. This article uses material from the "Cambodia" article on the DC Comics wiki at Wikia and is licensed under the Creative Commons Attribution-Share Alike License. This article uses material from the "Cambodia" article on the Marvel Database wiki at Wikia and is licensed under the Creative Commons Attribution-Share Alike License. 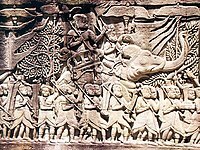 This article uses material from the "Cambodia" article on the Recipes wiki at Wikia and is licensed under the Creative Commons Attribution-Share Alike License.